Former Minneapolis city council member Dean Zimmerman: People love their cars for three reasons: 1) It’s sitting there waiting for you when you’re ready to go; 2) It goes where you’re going; 3) It gets you out of the weather. Everything else about cars we love to hate … PRT satisfies those three elements and totally erases every other single reason you love to hate the automobile … So, if you build a transit system that mimics the reason why we take the automobile and takes out the things you don’t like, people will switch from the automobile to that system.In terms of cost, the legislature is willing to spend all kinds of costs to subsidize all these kinds of transportation. No one is dif-ferentiating between capital cost and operat-ing cost … Every single vendor in here will tell you if we build this system, it will pay back its cost with revenue. Light rail takes $10 million a year of public subsidy. The bus system, 25 percent paid for by users, and let’s not even go into the automobile, the most heavily subsidized transportation system. PRT is the only system mentioned that will pay for itself in terms of operating cost. Not mentioned is the fact that Dean Zimmermann was convicted on 3 counts of bribery in 2006. This San Jose Podcar conference newsletter also has a PRT map created by Zimmermann. Enough Already! Sign the Waiver! Release the Exhibits! 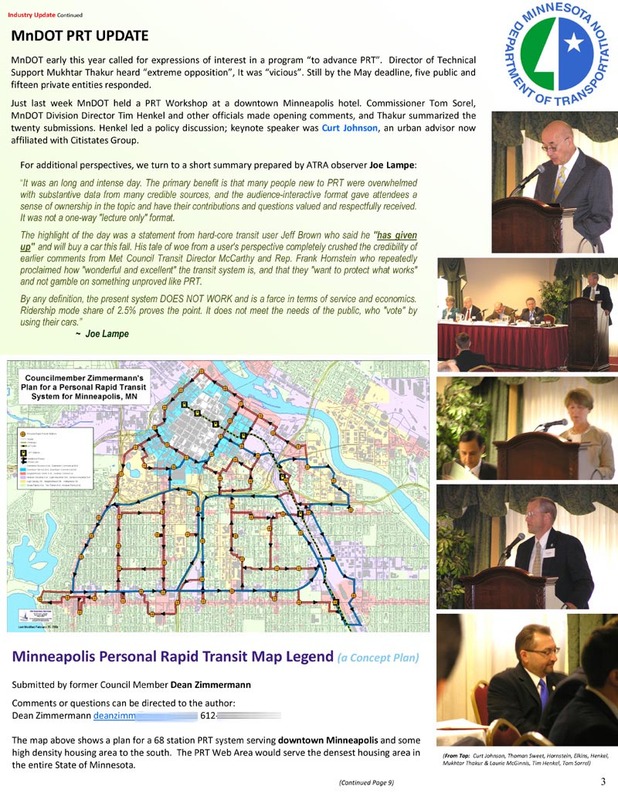 Every now and then, somebody on the Mpls Issues will claim Zimmermann was framed or persecuted as posted Wednesday. The subject being discussed was the city council being in the pocket of monied interests and developers. The reason I specifically mentioned Johnson-Lee and Zimmerman is that there is have been some claims that the Greens on the city council have been no more populist or resistant to corporate influence than the DFLers and I didn't feel that the examples we have had show that. As a person who most closely aligns with Libertarian Socialist political philosophy, they certainly haven't been as progressive or radical as I would like to see, but I suspect that any politician who was progressive or radical enough to make me happy would not represent their ward. I included Zimmerman because, while he clearly screwed up (and paid for it), I believe that he represented his constituency far more than he represented corporate interests. I say that even though I leaned towards Ken Avidor's perspectives regarding PRT (although with decidedly less vitriol on my part). 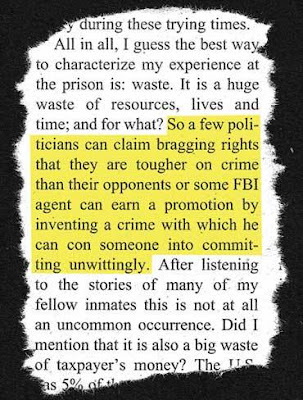 I didn't feel that his conviction was relevant to the question at hand, but since its been brought up, one might suggest that the nature of the crimes he was convicted of support my adding his name to a list of those not in the pocket of monied interests or developers. One example is the lack of a quid pro quo on the "accepting a gratuity" issue. Yes, accepting a gratuity from someone who has business in front of the city is (and should be!) illegal and Zimmerman shouldn't have taken an envelope of cash and especially not taken anything from someone with business in front of the city. However, while former CM Zimmerman was convicted of accepting and using money from a developer, the case also established that he did not vote in favor of that developer's interests. Also, IIRC, wasn't one of the things he was charged for basically leaning on a business who wanted some sort of zoning change? My recollection was that he wanted them to supply materials for a retaining wall that would mitigate a negative aspect of their requested change and that he intended to do the labor himself. Yes, again, this is the wrong way to go about it - he should have taken the process of letting them know that unless the wall were part of their application, he wouldn't be able to vote for them when their appeal came up or something like that. It may have been the wrong way to go about it, it may have been illegal, and it may have been part of what landed him in jail, but it strikes me as the sort of action made by someone who cares about their constituency and neighborhood. Anyway, it has been a while so I may be misremembering the details here, but these recollections are part of why I included Zimmerman in my list of examples of people who were not owned by developers or monied interests. It was not my intention to reopen discussions about the trail or conviction nor was I claiming him to be a paragon of integrity, but his conviction did not seem particularly relevant to the discussion at hand. Had he accepted money and then acted in that party's interest, it would be a different story. 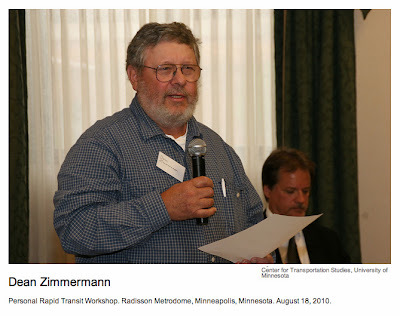 "Even the dogs in the street know"
That Dean Zimmermann was set up and was in fact one of the more honest and courageous members of the Minneapolis City Council . He sure as hell would not have rolled over on supporting Chief Dolan or RT Ryback. Like I said before, what happened to Dean was one of the more shameful moments in Minneapolis City Council history. However, when we speak of Cam Gordon being courageous and principled, I will have to interject another perspective. At the time of the Dean controversy, myself and others set up a meeting. We were discussing just how to deal with it. The meeting took place at Deans House on Clinton Ave. What I am about to talk about Dean Zimmerman or in fact Jenny probably do not know about because they were not present. At this meeting 15 people gathered. We talked about how to deal with it in the public. We decided to hold a Press Conference outside his house. The person chosen to speak on our behalf, in support of our friend, Dean Zimmermann was Farheen Hakeem. However, there were three people who opposed it. They were Cam Gordon, Annie Young and Dave Burger. Cam and Annie had been decades long friends of Dean Zimmermannn. They said that their concern was that "it may affect 'my' campaign." None the less, the issue was decided consensus style with the majority agreeing to publicly supporting Dean. I remember that a young lady present gave them all a good tongue lashing and pointed out that she was a Democrat but still supported Dean. However, it was what happened then that really stank to high heaven, in my own humble opinion. Apparently Dean's good friend Annie Young decided to call around and talk to any to discuss this further. However "fortunately" the only people she could get a hold of was Cam Gordon and Dave Burger. They decided, right there to create a new consensus. They cancelled the Press Conference that had been set up to give public support to their friend Dean Zimmermann. At a moment that he and the broader movement so desperately needed it. I know about this because I was there. So. like i said there are other perspectives on who has courage and integrity in the Minneapolis City Council. Urban Legend - Zimmermann "Absent-Minded and Somewhat Foggy"
.... A man named Carlson was heard to brag in a local bar that he was the one who set up Dean Zimmermann deliberately. It was a one-shot deal--not repeated. Zimmermann was not noted as the brightest bulb in the chandelier, but he was-- and is--noted for being absent-minded and somewhat foggy on details. Zimmermann also spent two years in federal prison, whereupon he has paid his debt to society. He also made restitution for his mistake, as per the terms of his sentence. The figures put forward were maybe $5,000.00, though it could have been less. Carlson got nothing from the city council in return for his money. seen in the national news, the GOP is not above misuse of various agencies of the federal government in order to gain and keep ascendency. Too bad those tapes are not as available as the exhibits in the trial of Tom Petters... it would clear up a lot of misconceptions for the folks on the Mpls Issues forum. I have never seen a smoking gun like Schiff-gate in Minneapolis politics. A developer basically describing how a council member shakes him down for campaign contributions. If this were chess, it would be a clearly won endgame for the Bicking campaign right now. But alas, it is not a chess game. Lit must be dropped, and the word must be spread. Dean Zimmermann was convicted and sent to prison for "accepting a gratuity." He accepted a campaign contribution from someone who had a development issue in his ward. He went to prison even though he voted against the developer's issue when it came before the Council. According to the CPRT.org website, the CPRT meets at Dean Zimmermann's home every month. ... Dave has followed PRT for some time and he knows quite a few of the people involved in CPRT. 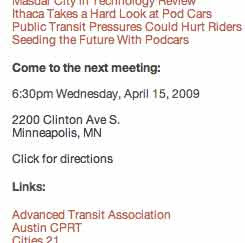 Dean Zimmerman, who is a Green City Council member in Minneapolis (neighboring ward) has been a strong proponent of PRT during his time in office (and like all the councilmembers, he's also up for reelection). "mass transit just doesn't work well. It's not even very good for the environment".... WTF? Has Bicking's positions on LRT and PRT have changed since 2005? We, the undersigned, protest the investigation, conviction, and imprisonment of Dean Zimmermann. As he begins his 30 month sentence in federal prison, we stand in support of an honest man who has dedicated his life to helping others, both personally and politically. We are convinced that Dean is innocent of the crime of bribery - a crime that requires intent. Dean has shown no signs of personal ambition; it is unthinkable that he would participate in corruption for personal gain. Indeed, his imprisonment is the result, not of corruption, but of his activism and his integrity. The FBI set-up is the culmination of over 40 years of FBI surveillance of Dean's political activities. This was a set-up, in the most literal sense: The cash, the witness and his script, the cameras, and the locations were all provided by the FBI. Unlike someone truly soliciting a bribe, Dean never asked for nor expected the contributions in cash, nor did he ask that they be given to him directly. The FBI never showed that Dean did anything for Gary Carlson that he would not do for anyone else. The prosecution could not find one other business person nor developer who would testify that Dean had asked for money in exchange for a favorable vote for their business or project. This is not the first time that the FBI has taken an interest in Dean. Dean Zimmermann has had a long history of political activism. He opposed atmospheric nuclear weapons tests in the 50s. He participated in the Civil Rights movement in the 60s, working on voter registration drives in Mississippi. He was an early opponent of the Vietnam War. He helped create the natural food coops in Minneapolis. As an elected member of the Minneapolis Park Board he promoted sustainable ecological practices. In his four years on the City Council, he worked on homelessness issues, for immigrant rights, for greater accountability to end police brutality, and continued his work for a better environment. As he puts it, his focus on the Council was "to make life easier for poor people, and to leave behind a planet that is fit for our great grandchildren to live on." The FBI also has a long history, and it is a history of dirty deeds inopposition to all the causes that Dean has promoted. An FBI agent even remarked what a low FBI number Dean had, indicating that his file goes way back. The infamous COINTELPRO program was created to, in the FBI's own words, "expose, disrupt, misdirect, discredit, or otherwise neutralize" dissident movements. In addition to keeping extensive files on activists including Dean, the FBI encouraged the selective prosecution of movement leaders, and worked covertly to incite violence and to split groups apart and pit one group against another. After Congressional investigations in the mid-70s, COINTELPRO was formally disbanded, but many of the activities continued, and the files were kept. Recently, new tools such as the PATRIOT Act give the federal government even more power. Surely the FBI, overseen by torture defender Alberto Gonzales, is as determined as ever to repress dissent. The persecution of Dean Zimmermann can be seen as nothing less than a warning to any elected official who would dare repudiate the Bush administration's repressive agenda. Even as Republican leaders have engaged in demonstrated acts of corruption and violation of the public trust, the US Justice Department under Gonzales has gone after more non-Republican elected officials than any other in modern American history. We will probably never fully know the motivations and circumstances thatled the FBI to set up a sting operation to try to entrap Dean. But if we think that Dean's case has anything to do with a sincere concern about ethics or municipal corruption, we have fallen into the trap set for us by the FBI. Ideally, investigation and prosecution should be a search for the truth. By their record of deception and distortion, the FBI has shown, its true intent. A centerpiece of the FBI's case is the famous "money, money, money" quote. 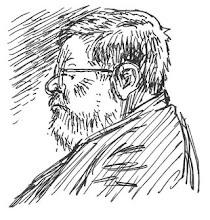 To obtain a search warrant, the FBI deliberately deceived the judge by depicting this as Dean's response to Gary Carlson at a "meeting in a restaurant". They did not reveal that this was a perfectly innocent quote, given the context that this "meeting" was one of Dean's many conversations during a large public fundraiser for his campaign. When they raided Dean's house, the FBI confiscated not just evidence, but nearly all of his campaign materials. His re-election campaign was crippled by this loss of mailing lists, phone numbers, address labels, etc., perhaps revealing their true intent. Any credible news source would readily expose these injustices, but the corporate media has been complicit in deception that influences the public's view of this case. Even after the trial was over and the true facts were known, the Star Tribune printed the transcript of the conversation with the "money, money, money" quote without revealing that it occurred during a fundraiser. Dean's unjust conviction and imprisonment will not negate the legacy of his decades of service. Like many true freedom fighters, Dean is paying a high price for his activism. Our hearts go out to him and his family., This hurts not only Dean, but all of us. It hurts the causes Dean works for, and it unfairly tarnishes the reputations of the groups he works with. The timing of the FBI investigation and raid also tampered with the democratic process. We miss Dean's leadership on the Minneapolis City Council. We stand in support of all political prisoners including Leonard Peltier, Mumia Abu-Jamal, and the Cuban Five. Dean Zimmermann is a political prisoner and we appeal to other groups, national and international, to recognize him as such. Dean has not asked for personal support; he asks only that we "continue the struggle". We will do that, while keeping in mind that part of that struggle is to defend our allies from persecution, and to support the right of activists to work without fear of retribution. Dean says it best: "Speaking on behalf of the poor and oppressed and generations to come is not always popular, but it is necessary. It is my life's work. It is my work as a public official and it's work I intend to continue." Thank you, our friend, for your inspiration and for your life's work. We look forward to your continuation of that work, both in prison, and when you are able to rejoin us afterward. 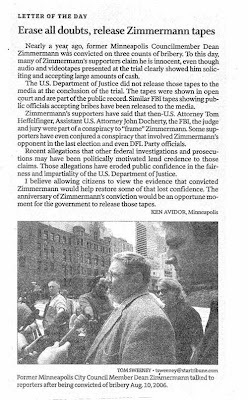 If Bicking still believes that Zimmermann is innocent, I hope he would urge Zimmermann to sign the waiver to release the tapes shown at his trial to the media so voters can decide for themselves. If you go to the Citizens for Personal Rapid Transit website (CPRT.org), you'll notice they had a meeting recently at 2200 Clinton Avenue South in Minneapolis, the home of convicted felon Gary Dean Zimmermann. Jenny Heiser, Zimmermann’s wife, comes in and Carlson asks for a campaign t-shirt. Carlson has a discussion with Heiser about line-drying their t-shirts and Heiser exits. Zimmermann tells Carlson, “this guy down here [in the 9th. ward] is running against Schiff, Dave Bicking…[Schiff is a?] significant obstacle, this’ll be in his ward. He [Bicking] could use a little promotion, he’s got an uphill battle, but he’s got no relation with Hamoudi and those guys,” even though he met with the Sabris. One of them [I don’t recall if it was Zimmermann or Carlson] mentions Sheila Delaney, a candidate Hamoudi [Sabri] and his friends promoted, who withdrew from the race. The CPRT has no problem with law-breaking, having broken IRS law to help get Zimmermann elected in 2005. Dean Zimmerman is a former Minneapolis City Council Member. A well known and respected member of the local progressive peace and justice communities, Dean is considered a hero by many people and has always been a champion of poor and oppressed people.